As part of that yummy endeavor, my better half realized he had peeled and grated way more potatoes than our exhausted exhaust fan would let us cook. And, sitting on the counter, they turned black BLACK quickly — any clues why? We gave up and turned our attention to more interesting things for a while. A little bit ago, he decided to bite the bullet and take the exploited, orphaned tubers outside. So my nightly giggle for you is the image of a 20something (and almost another year older 20something!) farmer putting nasty coveralls and mud boots on over his sleeping clothes, throwing a camo beanie on, and trekking out with a bowl and spatula into the chilly night. I made my husband buy me a bag of gummy worms. I’m still eating on them. Meatloaf, chicken and noodles, roll, salad, mashed potatoes, and corn. Peach cake (like my strawberry failure). Chicken and rice, salad, corn, green beans, roll. I also tried a dried date. No thanks. Hot dog, cold, plain. Gummies. Leftover chicken pasta, salad w spinach. Whew. I should do this more often. Hard to remember. Happy Monday! I know this is kinda a 180 from yesterday, but there is a two-edged sword in a long weekend. I grew up with 4H, band, quiz bowl, college classes, and anything else I could do. Whenever Dad needed help with a big project on the farm, he scheduled it for a Saturday and told me to be there. When I was upset, confused, or frustrated, I took walks in the pasture. Being busy was what I did. I read lots, but stayed away from TV (read: was crowded out). I had a pretty active life, you could say. And then I got to college and went way overboard. RHA (x2/week), department clubs, quiz bowl (x2 for a while), studying, friends, games, everything I could possibly do. I loved it. I was exhausted most of the time, with 10 hrs/day away from my dorm, plus studying/homework, and whatever people I was hanging out with. And then graduation came and everything just ended abruptly. I spent a couple months on the couch, making supper for the menfolk. Not even lunch or breakfast, just supper. Looking for a city job, and waiting for a call to farm work in the meantime. 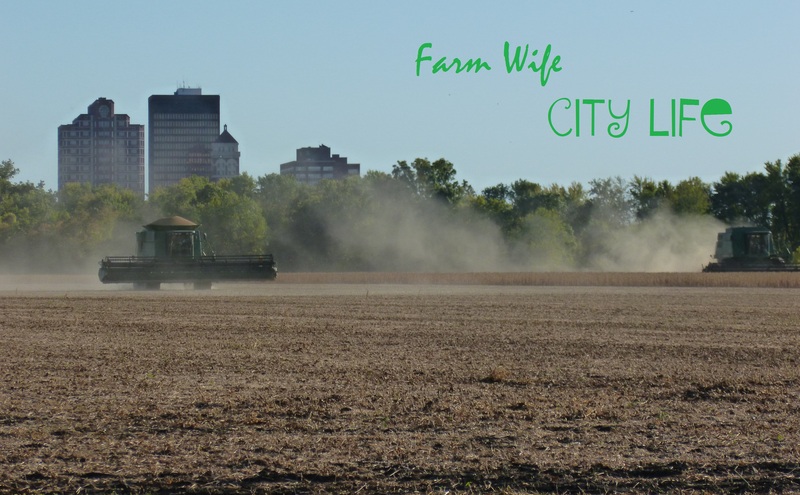 The city job came before the farmwork did, so I jumped at the busy-ness and the money. I have one of the best jobs for a farmwife. I have flexibility in setting my hours, get like 10 paid holidays, a free day a month (by working 8.5 days the rest of the time), and two weeks of vacation. Plus they have awesome dental, health, life, and prescription insurance, are conveniently located to some of our fields! Not that, like, any of that matters. Free days are usually taken to run errands (why isn’t anyone open after 5 during the week??) and even days that bring them that close to downtown are too busy for them to swing by and have a burger in town for lunch. Heaven forbid. Usually, a two day weekend means I sleep in a couple hours, do some laundry, get caught up on the dishes, go ride horses, check in on what’s goin on in the shop, make supper, and we go out with friends. Maybe fit in a run or Pilates. Maybe beg myself into the feed truck. But a three day weekend? The farm hasn’t waited on me, there’s nothing to do, and I get ANOTHER day of laundry and What Not to Wear (I’m on load two and episode three today). It doesn’t help that I have (between common sense and an addiction to Pinterest) this obsession with a pretty, clean, happy home. I wasn’t raised in a house that demanded or welcomed housework and traditional homemaking, and so maybe what I have now is a little bit of rebellion to that, too. But really, the biggest impact of my upbringing was that I never learned what to do to get that, and it really raised my tolerance. Yeah, the linoleum is muddy and the tables are cluttered, but I know how much worse it *could* be, so this isn’t so bad. And then it doesn’t help things when my husband says, you’ve been working so hard this week, take a break, do whatever you wanna do. If he thinks he’s using reverse psychology and one day I’m going to magically want to do housework, he will probably be waiting a while. All I *want* to do is sit and clean out my two folders of DVR and read. And sulk because I’m missing out on what I thought my life was going to be. Fair warning. I feel so helpless. Just a pawn. I work, I feed my better half, and then what do I do? I don’t have a purpose in life. No one needs me. There isn’t much I can bring to the table. Believe it or not, I wanted more out of life than myself. I want to be a part of something bigger. I don’t just want to have hobbies that make me happy. That’s all I have, though… So… Here I sit. Is it Monday yet? I’m really really sorry because I realize I really really am flooding you all lovely people (all like, four of you lol) with food lately… Feel free to give input now and then… I’m not okay with judgment, though. I realize eating ice cream as an afterwork snack before supper won’t get me Cozumel-bikini ready in eight weeks (my farmer pointed it out when I did it) so shaming me on my own blog isn’t nice, yo. To catch ya’ll up, 2013 is starting off nicely. The inlaws are almost done with their house, so FWCL is about to be DIY-heavy! If you have me on Pinterest, you aren’t surprised. We’re getting their house, selling this little trailer that has been home for the last year. The house is pretty nice, built in the 70’s, well-maintained, just needs a few updates.. Paint, new walls, maybe tear out a wall or two. Stay tuned! I’m also, for a variety of reasons, getting back on the fitness train (if you hadn’t noticed). I don’t just want to hit it hard and get the cruise body and then give up. I don’t want to do the yo-yo thing you always hear about, I’m looking for sustainable. Semi-Paleo is sustainable. Lots of water is sustainable. Running a couple times a week, Pilates two or three times, all that is sustainable. Let’s be honest – marathon training, strict diets, expensive plans.. Not sustainable. In the spirit of creating a fun, supportive environment, here’s my newest find: RunHundred. It requires an email to get in, seems like it’ll be pretty cool. It has lots of songs, sortable by several categories, with samples (not smartphone-friendly) and beats per minute info, and allow users to vote: would you work out to this? It’ll be a good site for brainstorming! I’m always looking for new playlist inspiration!! I’ll let you know over time what I think, let me know what you think! In other news, I’m a sucker for days off work. I snuck my farmer away last night as an early birthday surprise (no hike involved, as it turned out). It was nice to get away, run some big city errands, see another Oklahoma state park. It wasn’t his dream weekend, but after he got a nap and some Family Guy, he was much more agreeable and we got some good laughs over the geese and fellow guests. Now he’s tinkering in the shop (happy weekend for him lol) and I’m catching up on Netflix and there is STILL another day of the weekend!! Fantastic! She’s about 12, well broke, getting ridden once or twice a week now and needs at least that much attention. Not sure what her backstory is, she’s a little shy about some things, like maybe someone was rough with her, but we rode on the road the other day and cars and trucks and Banshees and whip cracking and standing around talking to neighbors didn’t really faze her. Right now I wouldn’t say she’s a kid horse, but fine for an intermediate rider, and may make a great kid horse with a few more miles! My friend thinks she’ll do great as a trail horse, she has a super smooth gait and isn’t spooky about much. Let me know if you want more pics or info! Anywho…. That’s enough for now! Mwah! We’re not particularly friends. Usually it’s being bossy, kicking me out of bed in the middle of a dream about WhoKnowsWhat, telling me to take a shower and dress up and head to work. And then the other alarm clock goes off, expecting the Mr to get up, get dressed, and feed cows, but all it really does is piss *me* off. ‘LOOOOOOOVEEEE! Get UP!’ One day I tucked him back in and he didn’t get up till almost 10. We like our sleep. But today, maybe because I’ve been sleeping better, we can be friends. Or maybe because I can get along with his ‘Sick and Tired’ alarm at 7 better than my ‘Low’ and ‘Whatever You Like’ and Gaga at 6… (Hiphop wakes me up, since it is, much less pleasant to listen to.) I hope it’s the amount of sleep. I hope I’m sleeping more, and better. Maybe it’s my renewed interest in fitness that makes me think about sleep. It’s kind of a big deal. There’s no turning back now. 13 in 13 or Bust!! Fried egg, sausage, biscuit. Fantastic. I love when the relatives come to visit. Cottage cheese and canned mandarins. 5 piece chicken strip with bbq (not as good as HC) from Sonic. We wound up not being hungry come suppertime. Dunno why. Going to get up and go for a hike soon, find some breakfast, and go home. Happy Saturday!! myfit Foods lunch ‘n learn schpiel. Had turkey chili, not totally sold on the program. Was staaaaaaarving by 2 30 when I got out of a meeting, so had a peanut bar. They’re chewy protein bars by Nature’s Own. I think… Isn’t that the brand with the granola bars you have to break with a hammer and hold in your mouth before chewing? Anywho, 10g protein and 6g sugar, better than straight junk food. Snacked on a little of last night’s cake and leftover bbq beef waiting on the oven. I added spinach to my salad and had that before my two bbq beef biscuits. The other half missed out on veggies. I don’t think he’s sad. The myfit presentation got me thinking… They base their meals on low glycemic, high protein, early carbs, and portion control. Is that really so hard to do alone? Maybe just no one wants to learn to cook quinoa… 6-10 lbs in 3 weeks is intense, and you can ramp it up more with exercise? Craziness. My better half volunteered to cook, and threw together penne, Ragu (extra veggies, of course), and leftover chicken. And then we planned meals for the week! I had errands to run at lunch, so I swung by Arby’s for a small fry, mid classic (no cheese) and lemonade. I was starving soon after though, and had a welch’s fruit snack packet. Slice of Colt’s cake and scoop of peach Breyer’s. Yummy. And I’m pretty sure I hit my 8 glasses of water! Peanut energy bar…. Realizing that peanuts and peanut butter really aren’t interchangeable. Strawberry cobbler disaster… Goo thing I had peach ice cream to save the day! Okay, so I won’t get so obsessed with miblogging that my WP starts to look like Twitter, but I’m on my stroll to my truck (so glad the new badge let me out and what on earth happened to this weekend’s weather??) so I thought I would take a couple minutes to say hi, how’s your day, because if you can see this, you have also been seeing my food diary, and for that I am sorry. I also wanted to cyber-jump up and down about the recent release of a Nike+ app for Android. Even though it will be well after 6 (aka dark) when I get home, I’m half tempted to try it out. Stoked to be able to leave the glorified pedometer at home. I have seriously been antsy since lunch when I found and downloaded it. And it’s Pretty Little Tuesday! Spencer finds out tonight! !